We have HSTR on farm. Darksaber Rancor Raiders are ready for HSTR greatness! Join us for Traya, gear and GP! HSTR will launch as soon as TB finishes! Hi Holo Table heroes! (That sounded weird). We are looking for 20 to 30 players to join into our main guild and sister guild (also you can come individually if you want). We are a over 100m GP guild. We win 70% of territory wars. We get 28-32 stars on territory battles. We are building teams and getting closer to HSTR (currently doing tier 6 easy). We are very very close to doing heroic sith and just need a few more good scoundrels (you) to get us there. * Be at least 1m GP (you will go into main guild or sister guild depending on GP). * Be active in raids, wars, and battles. * Don't go inactive for more than 7 days without letting us know. * Be actively working on teams for heroic sith raid (we will help you with this). * Install discord app, chat, and be friends with us. * Nice and relaxed guild yet competitive. * Mentorship and guild exclusive tutorials and guides. * An advanced and well organized discord server with lots of information and tools. * Lots of gear donations. Join our discord and ask us any questions! We are a USA based guild looking for active daily players to complete our team. We have our own discord channel u can join but it is not mandatory but does make communicating easier. We provide support for all players u need only ask and offer a fun and entertaining experience. So come join our growing family today and "May the Force Be With You"!!! 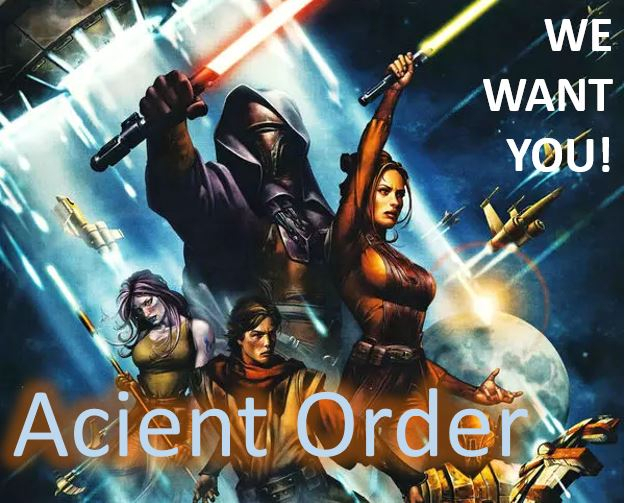 Join us in the Acient Order! We are a mixed nation guild, very kind and helpful and we are recruiting again. All heroic raids are on farm. No alliance guild. We have 164M+ GP and 42* last LS TB. 44* on last DS TB. Elite Cartel is a social and competitive guild, with players from Indonesia to California. Trilium has one rare spot for an active daily player. We are a breakaway guild that formed recently from the most actively players from a less active guild, and we are looking to refill our ranks with a roster of dedicated SW fans! We are a competitive (though not yet elite) group that has stuck together for more than three years through different guilds and we are very open to welcoming new players. What we offer: Friendly players across multiple time zones. Active player support, chat, and donations. Han Solo and General Kenobi shards (with more players Darth Traya shards as well). 24 hour join time on all raids. An excellent Territory War record from our previous, less active guilds. Finding us In-game "Mutineers Alliance"
Photo used with permission of and credited to AdamKop. New AA Empire looking for active players. Starting heroic sith raid in 10 hours. The return of Revan has us close to beating it! Have 3 openings now but will lose a member or 2 soon. Currently sitting at 119 million GP. Have a discord server but it s not mandatory. We really want JTR teams to make P1 go faster! But if you have a good nightsister or revan team we’ll take you too! My ally code is 987-392-717. Send me an ally request or a DM. I’ll check for requests right before I start the HSTR. We’re friendly and don’t get caught up on pressuring or yelling at guild mates. We want everyone to have fun and grow together. Talisman is an active progression guild looking for a couple strong members to keep us moving forward! 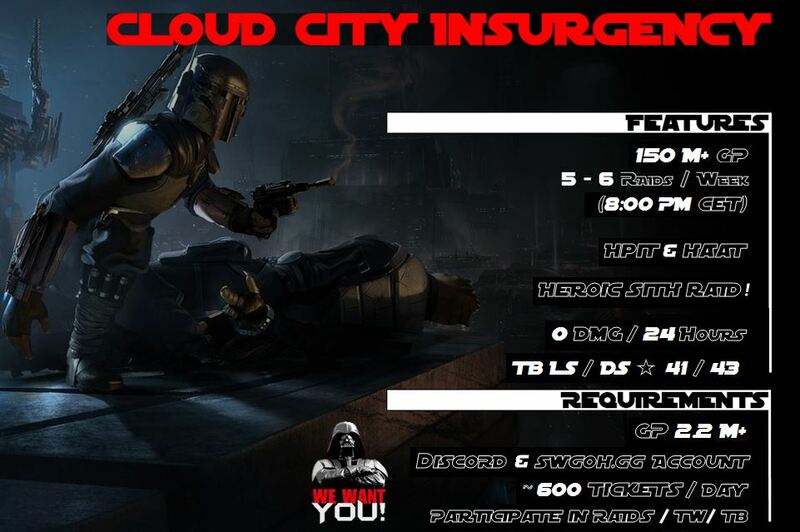 We are currently running T6 sith (need to update the poster) and are tracking for 26* in this TB! We're a helpful/friendly group from North America, Europe, and the Mid-East, but highly selective. Your roster strength, farming choices, and mods will be more-highly valued than your GP. The Fallen Kingdom is now part of the Shades of the Fallen alliance! Scot's Unite needs at LEAST 10 active players! We're at 40/50 players as we've recently booted some non-contributors and want to bring in fun/very active members. -I am one of the most active officers/members. Please contact me if interested. -must be lvl 85, 1.5mGP minimum, HSTR teams preferred. We have a number of Revans, 3pos, and Chewbaccas. The guild is getting very focused on strategically farming upcoming metas and getting ahead of the curve.